Florida’s “Stand Your Ground” law gained nationwide attention in connection with the George Zimmerman/Trayvon Martin case a few years back, but this defense to murder was in the news more recently for another reason: The Wall Street Journal covered the results of a study published in the Journal of the American Medical Association – Internal Medicine, which allege a link between Stand Your Ground and an increase in killings in the state. The points presented are controversial, but anyone who has been charged with homicide in Florida should be aware of how Stand Your Ground works as a defense to murder. 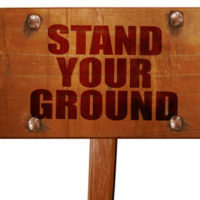 While the term “stand your ground” wasn’t used at the time, the principle has been a part of Florida law for more than 100 years. In an 1892 case, a state court held that a person may use deadly force in self-defense if there is a reasonable belief that it’s necessary to prevent death or great bodily harm. By law, you could only use deadly force in self-defense if you first did everything possible to avoid the danger, such as retreating. Some court decisions required that a person claiming self-defense in a murder case must “retreat to the wall” before deadly force would be justified. The commission of a forcible felony. Other circumstances that are defined by Florida law, where Stand Your Ground or self-defense claims are inapplicable. Claiming Stand Your Ground or any defense to murder is extremely complicated, and any errors in presenting your argument can lead to severe legal consequences – including life in prison. Your personal freedoms are at considerable risk if you don’t have an experienced Florida criminal defense lawyer to fight for your rights in court. Kevin J. Kulik is a Fort Lauderdale attorney who has represented many defendants in various criminal matters, so please contact our office today to schedule a confidential consultation.